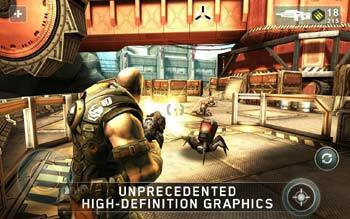 ShadowGun Apk is an action game by Madfinger games. There is no doubt that action games are everyone’s favorite. Also, I like action games like others, but my experience of action games in android is not so good. Main reasons for this is controls, which is not very good in android if we compare it to other gaming platforms and almost each and every action games are filled with IAPs and ads. And some other reasons are action games now a days comes without any story, without any good motive, games just start by killing your enemies and end with it. 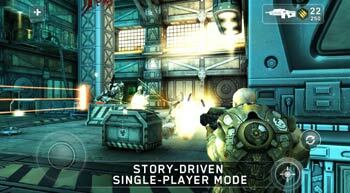 ShadowGun is also a third person shooter action game like most action games, but without any IAP and there is a also story in this game too. ShadowGun really isn’t about the story, but at least there is a story. 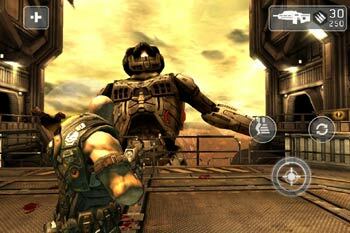 ShadowGun have superb console quality graphics, sound effects and there is no IAP in this game at all. And because of its all good features I can say that it’s one of the best android games of all time. SHADOWGUN puts you into the role of John Slade, the galaxy’s most infamous bounty hunter. Your mission: hunt down Dr. Edgar Simon, maniacal genius and leader of his own mutant army. Infiltrate Dr. Simon’s mountain fortress and fight his personal guard of cyborgs, battle droids, and genetically-enhanced humanoids. Using state-of-the-art weaponry, ships, and the assistance of S.A.R.A.—Slade’s personal android assistant—SHADOWGUN combines intense tactical combat with 3rd person action. – Featuring the most advanced combat A.I. to date—enemies flank, seek cover, and utilize teamwork to take you down! Battle automated sentries, aerial drones, and other lethal foes—tactical maneuvers are based upon actual military strategy! – Solve hacking mini-games to whet your nerdly appetite, then get back to blasting! – It ain’t just pretty—it’s gorgeous! Advanced lighting effects, beautifully rendered environments, and pro voices make this one of the most advanced games for your smartphone! – Immersive storyline with multiple outcomes! You decide how it ends! – The first installment in a major franchise! 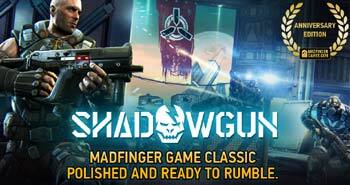 – Unlock the detailed “Shadowpedia”, and read more about the SHADOWGUN universe! – Survive the onslaught of Dr. Simon’s deadly creations, including level bosses, mutated grunts, killer machines, and more! Download Apk+Data for your device GPU. If you want to know your device GPU then you can download CPU-Z app to check your Device GPU. After download completed, Install APK, Place data folder in Android/Obb/here and play.